Hilltop Camp is the premier accommodation in the Hluhluwe-iMfolozi Game Reserve. Hilltop Camp is the main camp in the Hluhluwe-iMfolozi Reserve, one of Africa's oldest game reserves and a prime South African safari destination. This game reserve is home to the legendary Big Five and a great multitude of other game species. It hosts a very high concentration of both black and white rhino, and guests will most certainly have the opportunity see these ancient beasts on numerous occasions. 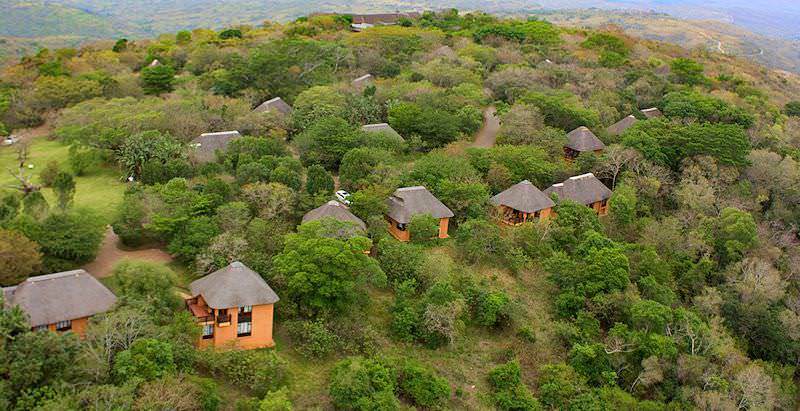 The camp is located at the top of a forested hill with exceptional views across the rolling hills of Zululand. Guests at Hilltop Camp are accommodated in 27 two-bedded chalets and 20 four-bedded chalets. When on enjoying an overland safari with African Sky, you will stay in your own room with an en suite bathroom. Though not luxurious, the accommodation at Hilltop is very comfortable with all the modern amenities. Attractive features like cane furniture and grass mats add to the ethnic feel of the thatched chalets. The main building and reception area of the camp include an a la carte restaurant, a bar area as well as a stylishly decorated, comfortable lounge. In the bar and lounge area there are photos showcasing the history of Hluhluwe-iMfolozi. The main building is positioned in such a way that a full view of the beautiful surroundings can be enjoyed. A swimming pool and small shop are also available. Following a flight to Richard’s Bay via O R Tambo International Airport, guests are transported overland to Hilltop Camp in the Hluhluwe-iMfolozi Game Reserve for their safari. Hluhluwe-iMfolozi is one of the oldest reserves in KwaZulu-Natal. Perched atop a woody hill overlooking the verdant rolling plains of Zululand, the camp offers striking views in an authentically African, rustic setting. Mealtimes range between hot and cold buffets to traditional braais. Hluhluwe-iMfolozi is home to the Big Five and a particularly high concentration of black and white rhinos. Open 4x4 game drives may also include sightings of cheetah, hyena and large herbivores such as giraffe and zebra. Zululand’s green textures render every sighting on this South African safari even more spectacular and vivid. Back at the camp, a forest trail leads visitors to the Hlaza Hide, which provides fantastic covert viewing. The Uzavolo bar and sparkling outdoor pool offer relaxation and recreation for the travel-weary. After Ntshondwe, Hilltop is the finest safari camp operated by KZN Ezemvelo. The camp is well located in the Hluhluwe-iMfolozi Reserve, and offers a very comfortable base from which to experience safaris in the national park. In recent years, the quality of the catering has improved substantially. I receive very favorable reports from clients and guides who have visited the camp, who comment both on the standard of the accommodation as well as the quality and frequency of wildlife sightings. Our tours and safaris in South Africa are our top vacation experiences. Travel to Namibia for a range of thrilling desert-based adventures. Zambia is known for far-flung safari areas like Kafue and South Luangwa. Travel to Mozambique for the African beach vacation of your dreams. Our safaris to the Kruger National Park range from budget-friendly overland adventures to exclusive luxury fly-in packages. The Sabi Sand forms part of an exclusive collection of private game reserves that share an unfenced border with the Kruger Park. Cape Town is a captivating city on the southern tip of the African continent, offering a wide range of tour experiences. The Garden Route is one of South Africa's top family vacation and honeymoon vacation destinations, flush with adventure.